I liked The A-Team movie. I watched it at home, not at the theater. I saw the movie knowing that it was a remake of a TV show that, let’s face it, wasn’t exactly a timeless masterpiece. Was the movie going to transform those humble origins into an Oscar-winning sensation? No, I’m fairly sure that The A-Team didn’t give The King’s Speech much of a contest. But it wasn’t really supposed to. I thought it had a nice blend of violence and comedy (plus violent comedy) that worked for me. It simply tried to be what it was without going over the top or selling itself short of what it could have been. In short: the film lived up to my expectations. Seriously, what did you expect if you saw Cowboys & Aliens? I saw the trailer that had… cowboys and aliens. Then the movie delivered cowboys and aliens and, I thought, did a decent job of it. Mission accomplished. Expectations are important in life. We like to have them met. We love to have them exceeded. We hate when they’re missed. Expectations are our way of setting a baseline for an experience. If we look at life on a scale of 1-10 then we prejudge an outcome and give it a ranking. Our projection of how much we will enjoy or hate what is to come give us a way of reacting to the outcome. Our outlook can affect how we judge an experience too. We can put such negative expectations on what might happen that we’ll drag ourselves down even if the delivery was reasonable. Or, we can have such a sunny disposition that a mediocre outcome can seem OK. Let’s say I’m going out to a nice dinner with my wife. I may have made reservations in advance and planned the evening well ahead of time. There may be an 8 projected in my head for the meal. The night out may deliver on it and I’d be pretty happy. As another example, we had sandwiches brought into a meeting for lunch from a place I like and that was tasty too. Of course it had a projected 4 or 5 on our scale. Again, it lived up to what I wanted and I was happy. Actually, someone in the office brought in some of my favorite chips and that kicked it up a notch. If these cases make sense to you, then the next point should hit home. Setting our expectations realistically is critical. If I have an experience hit close to what I predict then that helps me enjoy it if it’s positive or cope with it if it’s bad. It’s even possible to enjoy a trip to renew your driver’s license if the line turns out shorter than feared. Hoping for that short line and having it snake out of the building is another story. Getting that baseline in the right ballpark can help you feel good in many situations that may not even seem reasonable. It’s important to recognize when a reasonably favorable outcome happens and react in a positive way. If you’re expecting a date night 8 out of that office lunch then you’ll be disappointed in the sub even with the bonus chips. Coaching yourself up to tack on a +1 to life’s adventures can help put even a minor fiasco in perspective. I believe that matching your thoughts about what an overall experience will be to what is likely to happen. Leave yourself a little wiggle room so that there’s a little upside and you can feel good with the outcome. You don’t have to be satisfied always getting less. Setting yourself up to let life surprise you for the better is better mentally than always looking for things to fall short. I’m certainly not saying Always Look on the Bright Side of Life but give circumstances a chance to work out for the better. This concept of expectations is true when you consider your interactions with other people too. My last post was about building our personal brand. This is what people expect when they pick up the phone and call you. They may expect someone with a specific skill or piece of advice. They can expect to count on you or not. Your personal brand is a constant cycle of setting a good baseline for others then working to meet or exceed it. If you can coach them up a point or two per interaction then your brand will rise. 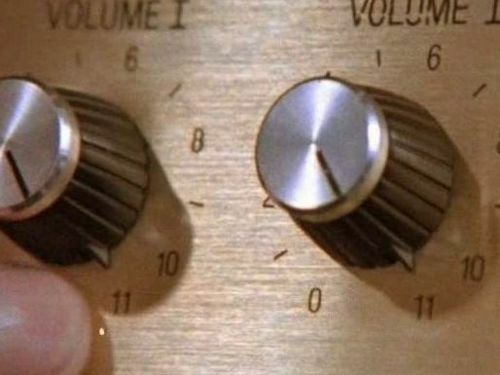 We can’t always expect life to go to 11, but if we work at it then we can make even the trivial seem more than just OK.